Your child is not alone. Itching is one of the worst symptoms an eczema skin can have. More so, it is quite difficult to treat. Sometimes, the itch can be so intense that it makes your child impossible to sleep well. No one knows exactly! It is thought that the skin affected by eczema releases certain chemicals that stimulate the nerves, which then pass message to the brain. The brain then tells you to respond to itch with a behavior, which is often scratching. Giving in to the urge to scratch is one of the main causes of redness and rashes in eczema. Do you realize that it is actually the scratching that does all the damages to the skin, not the itch? Once your child scratches or rubs, she can make her itch and eczema worse. 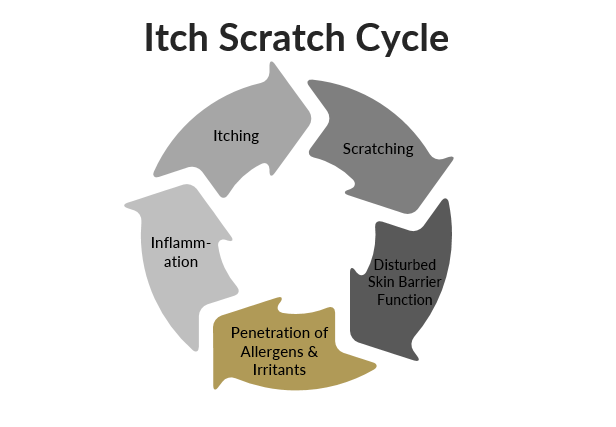 The itch-scratch cycle forms and scratching gradually becomes a habit that is hard to break. Some scratch so much that it bleeds, that is a set up for infection. When the skin barrier is broken, bacteria and pathogens can pass through it, exacerbating the scaly rash. This explains why if you can target the itch and stop your child from scratching, it can make a huge difference. No scratching means there will be no disruption to the already compromised skin barrier. Time to Review your Skincare Strategy? Skip thin lotions and reach out for thicker ointment or balm. You may need to assess if the emollient you use is suitable at this very moment. If your child’s sensitive skin is very dry, are you using enough and more than as required? Consider also if she might be reacting to her existing moisturizer. It is possible that if she has been regularly using a product over a prolonged period, she may build up sensitivity to that moisturizer that she has been using day in, day out. In this case, switching to using another moisturizer may be feasible. Some emollients’ formulations do not just keep the skin well hydrated, they may also contain anti-itch ingredients such as witch hazel, evening primrose oil or borage oil, plantain, mullein, calendula, oats, neem, tea tree, peppermint, etc. ‘Soak and Seal’ is highly recommended as one of the most effective ways to combat skin dryness, itchiness and flares. Especially when it comes to soaking irritated and inflamed eczema skin. Soak in a tub of lukewarm (not hot) bath for 5 to 15 minutes to rehydrate and allow your child’s skin to better absorb moisture. Then lightly pat dry (no vigorous rubbing) and quickly follow with thick moisturizer within 3 minutes. Some baths offer other therapeutic benefits as they include herbs, salts (minerals) or oats that help soothe and relieve your child of the irritation and itches of eczema. 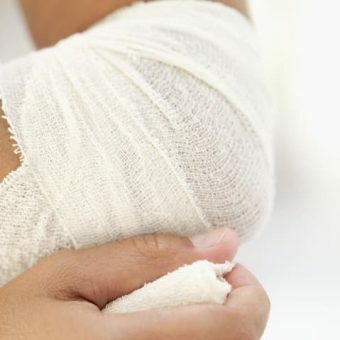 Wet wrap is a bandage system that is usually reserved for treating severe eczema or occasional intense itch. This step is added after a bath, where layer of damp or wet clothes or gauzes are placed or wrapped over the treated part of the skin that has been applied with emollient. Then, top that with another dry layer of gauzes. Cotton gloves and socks can be used for hands and feet. These layers are left on for a few hours or overnight to help seal in the moisture and allowing the skin to stay cool. Where antihistamines or topical steroid are prescribed by doctor to help reduce irritation and itch, they are quite often also used to allow your child to be able to get some good night sleep. Importantly, please don’t be too hard on yourself and your child. Eczema creates such insatiable urge to scratch that is so hard to resist; yet it is an itch that you can’t scratch. You can certainly begin with using the above information as a starting point together with good emollient and bathing routines coupled with topical medications if prescribed by your doctor to keep that agonizing itch in check. 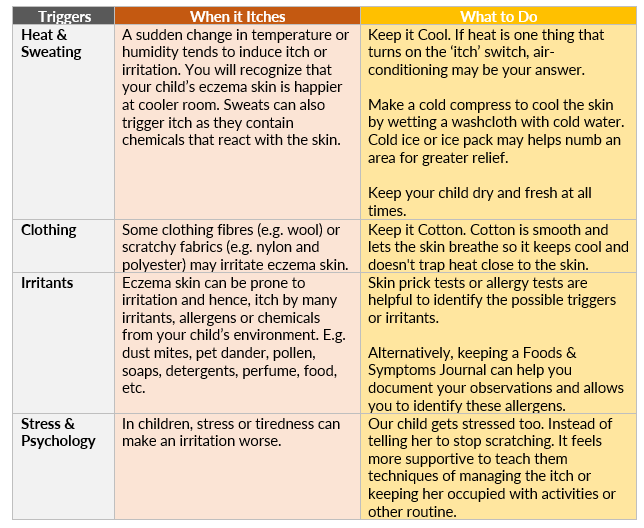 Next stop in Dealing with Skin Infection, we are going to deal with skin infection in eczema; including how do you recognize if your child’s eczema skin has been infected. Equally important, what you can do to prevent infection from happening in the first place after understanding why it is better that you prevent it rather than treat it later! This entry was posted in Baby Eczema, Eczema & Bathing, Eczema & Dermatitis, Eczema & Infection, Eczema & Moisturizing, Eczema & Steroid, Itching & Scratching and tagged anti-histamines and eczema, cortisone and steroid, Eczema and itch scratch cycle, how to deal with eczema itch, itching during eczema, moisturize and eczema itch, scratching and eczema, soak and seal during eczema flare, wet wrap and eczema.